Innovation within tradition. This is the guideline the Camuzzi Group has been following since it entered the yachting world, first acquiring Baglietto in 2004 and subsequently Cantieri di Pisa, two of the most prestigious top-drawer yards on the Italian pleasure craft scene. Two names which in themselves are a symbol of quality, style and exclusiveness. Two boatyards whose histories are comprised of great boats that have left their mark on international yachting. Two brands which the Camuzzi Group has decided to positively exploit by highlighting the uniqueness of what each one offers, precisely through respecting the tradition that lies in these names. But of course this tradition goes hand in hand with profound and continual technological and stylistic innovation in order to supply customers with a product that is always at the highest levels of comfort and performance, but always respects the tradition of the individual yards. And it couldn't have been otherwise. Hence the need to equip the Camuzzi Group with its own engineering centre, Camuzzi Nautica Engineering, which has been officially operational since the beginning of the year but in fact has been so for some time, having handled the entire project, from hull to interior layout, from plant to structures, for the 58 metre yacht under construction at the Baglietto yards in La Spezia, scheduled for delivery in 2008. The superstructure design for this approximately 450 tonne vessel, actually a ship to all effects and purposes, was also carried out at the Centre by architect Franco Bruno. Design of this semi-planing hull (max. speed 24 knots) also involved particularly difficult aspects linked, for example, to the construction of hull and superstructures totally in light alloy. Other especially delicate design aspects regarded the creation of a helipad, which required in-depth study and the solution of problems connected with the structural strength of the deck and the possibility of safe landing even with a sea running. This possibility was guaranteed by means of a "zero speed" stabilisation system with a double pair of stabilising fins. The Centre, now a Camuzzi Group company headed by engineer Massimo Ragone and operating with its own precise identity, has a workforce of around 15 and its headquarters are on the traditional Baglietto premises in Varazze. Precisely in the name of tradition and continuity, Camuzzi Nautica Engineering counts on the consultancy and collaboration of engineer Alcide Sculati. This internationally famous professional of indisputable technical abilities designs fast yachts and ships, and was one of the first in the world to use light alloy and hydrojets for large pleasure craft. Sculati, technical head of Cantieri Navali Baglietto in Varazze for more than fifteen years before moving on to take over the helm at Rodriquez Engineering, has designed some of the most important and significant vessels on the Italian scene, pleasure craft and otherwise, such as Rodriquez's series of fast ferries, the famous Aquastradas. Camuzzi Nautica Engineering works for all the Camuzzi Group's yards: which is to say for Cantieri Baglietto, in Varazze and La Spezia, Cantieri di Pisa, and also for the Group's more recent acquisitions: General Bateaux in Tunisia, traditionally a subcontractor supplying parts, components or entire hulls for other European brands, but now working almost exclusively to meet the Group's needs; and Wmagic, where Wally Tenders are built and where there is a project envisaged to supply uniform building modules for the whole Group. "What led the Camuzzi Group to set up its own Engineering centre," explains Camuzzi Nautica Engineering General Manager Massimo Ragone, "was fundamentally linked to the need to control the project at first hand, right from the preliminary and initial phases, in close contact with business management and the customer. This means we can fully satisfy clients' requests, defining them with precision from the feasibility study onwards. In a strictly "custom" production situation such as prevails at Baglietto and Cantieri di Pisa, it has proved to be a winning philosophy. Moreover, it allows optimisation of certain aspects of both design and production, such as being able to balance and render uniform certain technical and design choices regarding the products of the various brands, this subsequent to a more in-depth and targeted phase of study and research. The result is a saving in terms of costs and weights on board and increased synergies among the brands. Another important aspect facilitated by total project control concerns the more precise and efficacious application of technical standards, which are increasingly more complex and restrictive today. Since in almost total Group production we're dealing with actual ships, both from a technical and standards viewpoint, these vessels have to possess safety requisites that satisfy the specific technical standards demanded by Classification Technical Registers (such as R.I.Na, ABS, Bureau Veritas, DNV and others, depending on the customer's specific requirements) or by international agreements (e.g. SOLAS, the Convention for the safeguarding of life at sea). Building yachts at this level," continues Ragone, "means obligatory observation of the safety standards envisaged by the Large Commercial Yacht Code, another body of regulations and prescriptions specially drawn up for commercially employed pleasure craft (i.e. charter) by the Britannica Maritime & Coastguard Agency (MCA). Lastly, an aspect which should in no way be overlooked, a centralised Engineering unit means that you can create a database that collects all the Group's know-how and experience which, over and above becoming an exclusive asset, leads to a greater and more uniform technical and productive growth of the Camuzzi Group as a whole. Obviously Camuzzi Nautica Engineering doesn't replace each individual yard's technical department in terms of building management and supervision, or resolving the problems great and small that arise during construction of a vessel." But what exactly is done at Camuzzi Nautica Engineering? "The professional skills we have at the centre," Ragone replies, "give us complete control of the CAD project. As for the CAM part - Computer-Aided Manufacturing, i.e. the software that permits management and control of a computerised numerical control machine tool for cutting sheet-metal or milling mould models for building in fibreglass - we bring in specialised companies or the competent departments of the same companies which possess Numerical Control machinery. As for designing the structures, at the centre we carry out direct calculation sizing or apply the rules of the Classification Registers; or, depending on specific needs and evaluations, we use FEM software (Finite Elements Method) for structural calculation, thus obtaining a more precise definition of the stresses and loads on the structures. This results in a more targeted sizing and a consequent saving of weight on board. Another design instrument we intend to acquire and develop is CFD, Computational Fluid Dynamics, a technique by which fluid dynamics can be studied and a vessel's behaviour and performance predicted by computer, bypassing the need for tank tests." But as Ragone points out, "the CFD technique is an instrument to be used with due caution both because of costliness in terms of the specific professional abilities called for, such as the time required for preparation and execution of the calculation, and because the results are not yet wholly reliable. So tank tests on models remains for Camuzzi Nautica Engineering an important verification of hull design. Naturally Camuzzi Nautica Engineering also brings in authoritative and prestigious professionals from outside, sometimes to ease a particularly heavy workload but above all to have the best technical response available to solve the design problem of the moment. Camuzzi Nautica Engineering works with outside professionals who guarantee top-class responses and avant-garde solutions concerning, for example, soundproofing problems and techniques or propulsion problems. It brings in great yacht design names such as Spadolini and Paszkowski, carrying out an important link and coordination function between the owner's requirements, the designer's flair and genius, and matters regarding engineering and budget. On the other hand the Group's yachts, be they built by Baglietto or Cantieri di Pisa, with their stylistic and typological differences, are always and in any case absolutely exclusive customised craft, each different from the others, one- offs that can face time without suffering from fashions and without losing their beauty. Thus the Engineering centre guarantees that even with special fitting out choices made by the owner, and with the creativity of new designers, the precise and unmistakeable style of a Baglietto or Cantieri di Pisa yacht will remain the same." 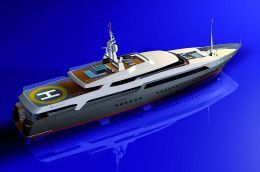 At the same time the centre is able to undertake a complete project, as in the case of the Baglietto 58 metre mentioned above. 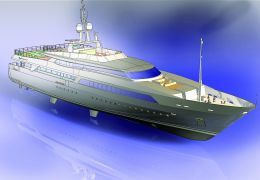 Or it can carry out at first hand a part of the project while also coordinating and handling the relationship with various professionals and designers, as in the case of the new Baglietto 41 metre semi-displacement yacht, now in the advanced design stage, of which two examples will be delivered in 2008. This little ship is a new step forward in Baglietto production, always renowned for significantly fast performance hulls: this is an actual bench test with view to blending new features, new lines and new requirements into the tradition and continuity of the Baglietto style. The yacht was designed by architect Francesco Paszkowski while the Engineering centre handled hull, motorisation, plant and structures. As mentioned previously, it's a semi-displacement hull which achieves speeds beyond the typical range of this kind of vessel. In fact notwithstanding 210 tonnes displacement, with two 2040 Kw MTU 12V 4000 engines she reaches 23 knots, thanks to special hull forms called in the jargon "high speed round bilge", generally used for military craft such as patrol vessels and corvettes. From the hydrodynamic viewpoint, for example, with the aid of various tank tests the centre also studied and defined a bulb that optimises cruising speed, in the specific case equal to 20 knots, very close to maximum speed. Camuzzi Nautica Engineering is therefore capable of totally handling a yacht project, but of course its activities include looking to the future, towards research, development and experimentation with new technologies, new aesthetic and/or functional solutions. The centre is therefore taking action with view to collaboration and participation in certain European Community research projects or in tandem with universities and Research Bodies. For the future it will be highly important to study and experiment with the new options offered by the market in terms of both materials/technology and of new products or apparatuses to install on board, in such a way as to implement a kind of filter for the Group's production activities which, before applying or installing the "novelties", will have a guarantee of their correct functioning and actual efficaciousness. Camuzzi Nautica Engineering operates out of the traditional headquarters at Cantieri Baglietto in Varazze, which has produced some of Italy's most significant and prestigious yachts: from the first competition motoryachts of the early 20th century to the MAS, the motor torpedo-boats of the first and second world wars; from the legendary patrol boats to the splendid and revolutionary yachts of the Ischia series and so on. On the imposing Varazze premises, which date to the 1930's and where almost 700 people worked in the past, you breathe the very history of Italian shipbuilding. In the old "mould loft", now a warehouse, you can still see the engraved lines of the templates for construction of the Ischias. So not only photos, old models of patrol boats or yachts, but also the old tools of shipbuilding carpenters and traditional equipment, side by side with the most modern technologies for working and treating aluminium, and a current production that will occupy the yard fulltime for the next three years. 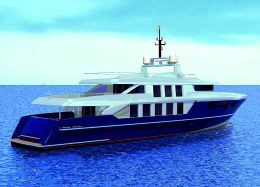 Yard manager in Varazze, Edoardo Ratto, illustrates this programme in detail, starting with the 44 metre 210 tonne semi- displacement vessel, maximum speed 30 knots, scheduled for delivery in April 2007. Then, again for delivery by 2007, another 3 fast superyachts: one of 42 metres and two of 34 metres. 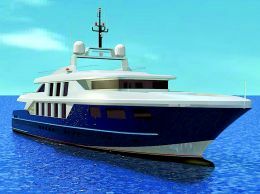 Two small semi-displacement ships are scheduled for delivery by 2008, together with a 34 metre "hardtop", and for 2009 a new 44 metre, two 42 metre and another 34 metre. To meet the requirements of such production volumes the yard has extended the slipping quay and acquired a new 300 tonne travel lift, one of the biggest in the Mediterranean. These upgrades mean that the yard can further develop the refitting and maintenance services which are indispensable today in order to offer owners across the board assistance. The yard directly employs a staff of about 40, but there are 200-250 people - technicians, labourers, welders, carpenters, installers etc. - daily employed on the 20.000 m2 area, covered and open air, of the Baglietto of Varazze shipyard that creates dream yachts. The entire yard will shortly be completely renovated to bring it into line with new requirements in the context of upgrading the whole Varazze port area, where a new Marina has already been created. One part will be transformed into a luxury hotel while another part will house a maritime museum dedicated to Varazze shipbuilding and the history of the Baglietto yards.